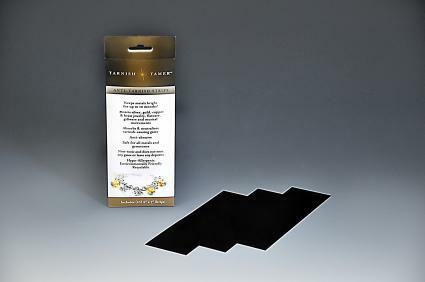 If you are looking for a way to prevent tarnish build-up while protecting your jewelry or flatware, consider a product from Tarnish Tamer. This brand features several options that are designed to keep your metals shiny and brilliant. As a member of LoveToKnow's editorial team, I was sent several Tarnish Tamer products to test and am happy to report the results in this independent product review. 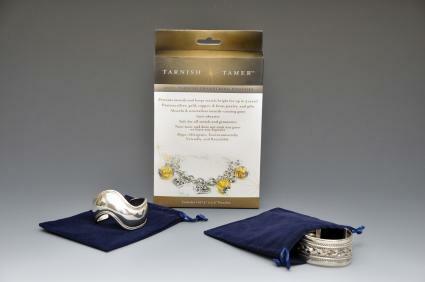 Tarnish Tamer has a line of products that can prevent tarnishing of your silver pieces. The products can be used for jewelry, flatware, candle sticks, serving pieces and more. Tarnish Tamer has a unique formula that can prevent build up of tarnish. The products work by absorbing and neutralizing gases that cause corrosion and result in tarnish. I tested two of the company's products: Drawstring Pouches and the Anti Tarnish Strips. The drawstring pouches are perfect for jewelry and other small silver items. They are done in a luxurious fabric that will protect your valuables. To use the pouch, simply place your cleaned silver item in it and secure the pouch with the drawstring closure. Tarnish Tamer is instantly activated and will protect your item for up to five years. Since the pouches are safe for use with all metals and gemstones, you can place anything you own in one. They not only are great to use as silver protection but work well for travel. I have placed a silver bracelet and necklace in a pouch and it has stayed shiny and tarnish free. The pouch can easily be placed in a drawer or jewelry box and can be placed in a purse or tote as well. The other item that I tried is the Anti Tarnish Strips. The strips come in a box of 10 and are activated when put to use. They come in 2" x 7" strips, but can be cut to fit smaller areas. The strips are to be used in jewelry boxes or other containers, where they absorb tarnish causing gases and will work to prevent tarnish from building up on your possessions. To use the strips, simply place them in the drawer where your silver items are. They will instantly begin working to protect your items. I have these strips in my jewelry box and in my silverware drawer. I made sure that my silver items were cleaned before I stored them away and cut the strips to fit where my items were placed. I have not noticed any tarnish developing on my pieces since I began using the strips. Since the strips can be cut to fit wherever you need them to be placed, they go unnoticed and take up no extra space. Tarnish Tamer products can be found online at Tarnish Tamer.com. In addition to the products I tested, jewelry rolls, large storage pouches and other items are available. Check Tarnish Tamer's "purchase" link to find a dealer near you. If you spend a lot of time cleaning your silver pieces, I would recommend storing them in a product from Tarnish Tamer. These products add protection from tarnish and will keep your items organized and safe.